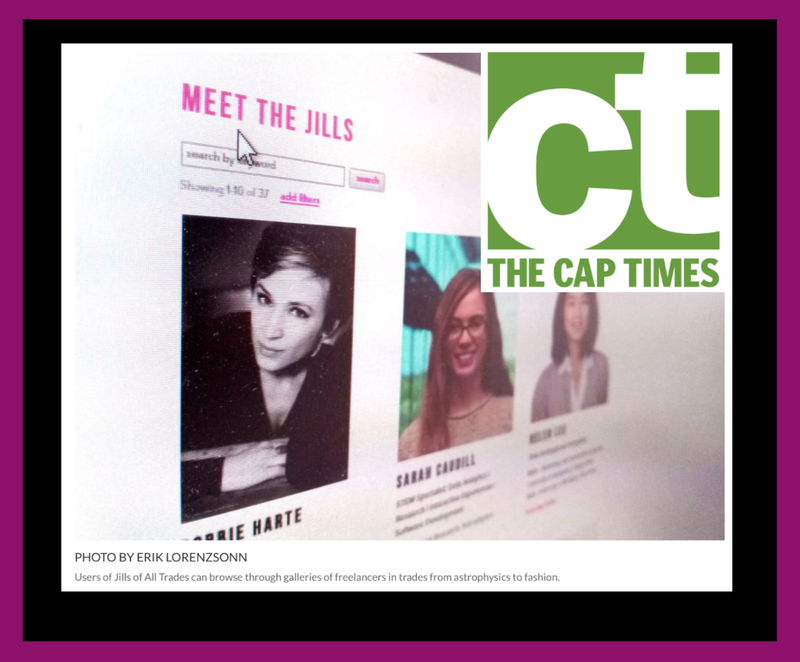 THE JILLS OF ALL TRADES™ Co-Founders, Megan Boswell and Corinne Neil, jumped in to the 1 Million Cups community last week to share their start-up story and their mission to prepare women to lead the future of work. "We're so lucky to be part of such a wonderful and welcoming community of entrepreneurs in Madison", explains Boswell who promoted the importance and the power of women entrepreneurs helping women entrepreneurs as the basis for THE JILLS OF ALL TRADES™. "If you remember nothing else about us, remember this, we're women entrepreneurs helping women entrepreneurs", she said. I Million Cups is a weekly coffee meet-up at 9:00 am across the nation sponsored by the Kaufman Foundation as a way to to educate, engage, and connect entrepreneurs locally and nationally. I Million Cups Madison organizers, Rachel Neill and Drew Coursin invited THE JILLS OF ALL TRADES™ to present on Wednesday May 10th to a busy entrepreneurial crowd at the Madison Public Library, including The Capital Times reporter, Erik Lorenzsonn, who put THE JILLS face forward in his article, Startup looks to put women 'solo-preneurs' in spotlight. CAPTIMES ARTICLE BY ERIK LORENZSONN. Startup looks to put women 'solo-preneurs' in spotlight. "We were thrilled to have the opportunity to share our story," says Neil, "and to be able to reach out to the entrepreneurial community to help fuel our momentum and support our JILLS MEMBERS." When you're starting a new venture, or a new adventure, finding a community of support is critical. Because when you're stepping out in a new territory, you're going to need to find experts, and mentors, and people who have walked a similar road before. You'll need advocates and evangelists, accountability partners and coaches. You'll need to nudge your way to the center of a web of networks. you'll need a group of peers to share the highs, the lows, the missteps, and the wins. You'll need to create structures for collaboration. You'll need to make sure you don't take all of this on alone. We are forever thankful that we found a great community of support as we began to move THE JILLS OF ALL TRADES™ from an idea brewing in our minds as we collaborated in our basements, to an organized, thoughtful venture. The Madworks Seed Accelerator provided us 10 focused weeks to get our legal ducks in a row, secure some funding, set goals, get feedback, access new networks, and connect with a cohort of peers who made us laugh, extended us needed criticism, welcomed our ideas, championed us when we lost our footing, and made us feel like we were not alone on this crazy ride. It really is a mad, mad world out there, folks. Find your people. Know your tribe. Build your community.